Hooray, it’s December 1st, which means it’s time once again for me to make an effort to post daily for an entire month, for Holidailies. How convenient I have a whole bunch of stuff stored up to talk about because I have been ever so lax in updating this thing (oops). But instead of updating on all the stuff that’s been going on the last couple months, instead I’m just going to talk about baking. 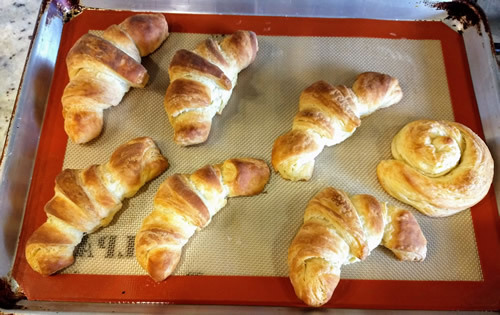 Because this morning, on a whim, I decided that I really needed to spend several hours tied to the kitchen, and so along with several other things, I made croissants, from scratch. I’ve worked with laminated dough before – you have to follow the directions and not chill the butter too much, or let the dough or butter get too warm – but the primary reason why this isn’t something one does on a regular basis is just time. The actual hands-on time isn’t all that much, but you have to pay attention to the clock, because with the folding and the rolling and the resting, the whole process took about four hours from start to finish. I used the King Arthur Flour recipe because they’ve never steered me wrong yet when it comes to baking, and this time was no different. An interesting twist in this recipe I haven’t seen in other laminated dough recipes is that you mix the butter up with a little flour, which keeps it a little bit more pliable for the lamination process. 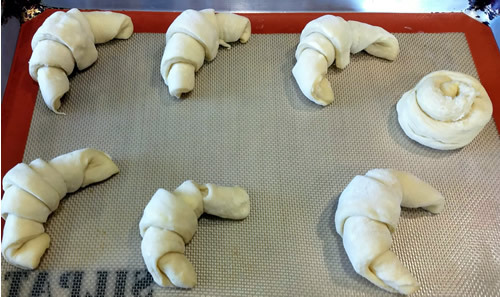 The recipe makes two dozen croissants. I stashed half the dough in the freezer for later, uncut. The remaining dozen I rolled, but stashed half of *those* into the freezer for later, leaving six croissants, plus the scraps from the edges that I just spiraled into a little bun. When they baked, a couple lost their ‘curl’, and also I forgot to eggwash the tops, but no matter, they still browned up nicely. Clearly my croissant shaping skills need some work, but they turned out *quite* delicious. The top layers crumbled messily, as a good croissant should, and when I cut one open I was quite excited to see lots and lots of layers, which is exactly what one should see. They are smaller than the ones you might find at your local (good) bakery, so the leftovers made the perfect accompaniment to the soup we had for dinner. Yum. This entry was posted in Baking, Kitchen Adventures. Bookmark the permalink. I think imperfect baked goods are the best kind because they’re obviously homemade. And your croissants are lovely. Happy Holidailies. That said, I love making things from scratch instead of pre-packaged. My favorite do-it-yourself kitchen projects are pancakes and cookies. Followed by breads, mostly because they take more work than pancakes or cookies.